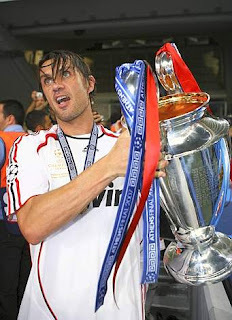 One more trophy for Maldini before he bows out of football. Milan have landed in Japan where they will begin their preparations for their first Club World Cup game on Wednesday evening. The rossoneri along with the Argentina's Boca Juniors are hot favourites to go all the way to the final again where they met in the December of 2003 where Milan lost out to Boca on penalties. “It's the first time we play it with this new formula which I think is more difficult than the previous one. Fortunately we will have the chance the get used to the time difference and the rhythm of Japanese life." After winning it twice and losing it three time Maldini is more determined to win it once more before h e ends his career with the rossoneri at the end of this season. However, the 5 times European Champion has only just returned to action following a recurring knee problem and rumours have been said that he could bring forward his retirement to straight after the tournament in Japan. Nevertheless after such an illustrious career full of Finals, Maldini is still hungry for more and remembers all the ones he took part in. "Personally I remember the finals I've already played: the first time we went to play it without being fully aware of the importance of this Cup, we only realised it after we won. The last three, instead, still hurt. The first one, against Sao Paolo, we lost after having played at the same level as them. In the last two we went home with a sour taste because we were not inferior and we really wanted to do well." While Maldini is injury free, Ronaldo is still a huge doubt for Wednesday and if Milan are to make the final, it looks like the Brazilian will once again miss the chance to help Milan win another trophy. However, the European Super Cup hero Marek Jankulovski seems to have over come his knee injury and may be back to make his first appearance for the rossoneri after 2-3 months on the sidelines. I hope that Milan can do it, it would be a fitting honour for a great player like Paolo. this is a pain in the arse competition. It generates some money and gives the Japanese an opportunity to watch quality football. But it doesn't mean that much. I haven't heard too many kids arguing in the street that their team was better because it had won more CWC's than their mates team. As a Milan fan it would be nice to get another trophy but i would have prefered it if the team could have concentrated more on their woeful league position rather than holiday in Japan. It would be great to have Milan win another trophy, to bring back another trophy to Italy and restore Italian pride. I hope Paolo can win more Trophy before he retires. He deserves it so much!